Here' is Pam Crooks' medallion top for her friends' challenge using the Uwa reproduction fabric, the same challenge that inspired Cindy Vermillion Hamilton's quilt. I think the fabric in question is Pam's border here. Do you have [medallions] in your collection? Can you give us a little history about medallions? 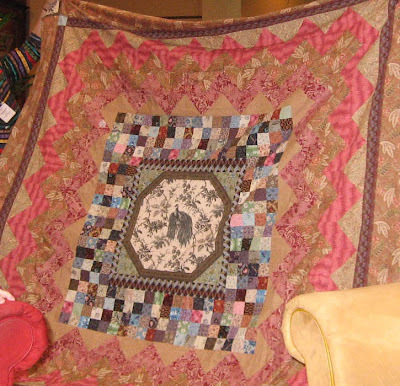 "Early quilts often have a central design focus, a setting style Americans tend to call medallion quilt and the British call framed quilt or frame quilt. The terms seem to date only as early as the twentieth-century, possibly established in 1929 by quilt historian Ruth Finley who described a quilt with a tree-of-life center as a "framed medallion" in her book Patchwork Quilts and the Women Who Made Them. Although women working after 1840 were likely to use a block format, earlier quiltmakers preferred the medallion set. On my website I maintain a list of eighteenth-century quilts with the date actually on them. (See it by clicking here: http://www.barbarabrackman.com/faqs2.aspx) Of the 14 quilts in which I could identify a set or style 11 were constructed with a central focus (about 80%). Of quilts date-inscribed in the 1840s I found the opposite; 80% were block-style, a dramatic style shift in the century's first decades." ....And as Homer Simpson would say "Doh!" I didn't realize that if you clicked on the pictures here they get larger! So click on Pam's quilt. Wish I had a better photo. Wow! Another beauty! Thank you for sharing these and also for the history behind them. I should consider doing one of these in the near future.